Light on Grace is very important to me, but so is battery capacity. She came with standard halogen lights which output extra bright light, but are not power friendly and get hot very quickly. After a bunch of experimentation and different manufacturers, I’ve settled on a replacement bulb that has a single CREE LED on it from SuperBrightLEDs.com, plus a couple from MarineBeam.com that help with night vision. LED light replacements are pretty common on boats nowadays. In fact, on Jammy I replaced all of her original fixtures with LED capable lights over the 11 years I owned her. At that time, LED replacement bulbs were either not available, or very unreliable, so fixture replacements was my only option. It was very expensive and time consuming. Beneteau used Aqua Signal halogen lamps when they built Grace, each containing a G4 halogen 20W bulb. The fixtures were all in great condition, so rather than trying to replace the whole fixture, I sought out options for the bulb only. After some cursory searches, I found a ton of options for LED G4-style bulbs. My first experimentation was with MarineBeam LED lights recommended by folks on various forums. The quality of light was very bright, and in the case of my main cabin area, too bright for visitors. I had multiple complaints of the harshness of the light, and people immediately identified it as LED even though it was still warm-ish. Additionally, the cost per unit for some of these lights was pretty high at $15-22. 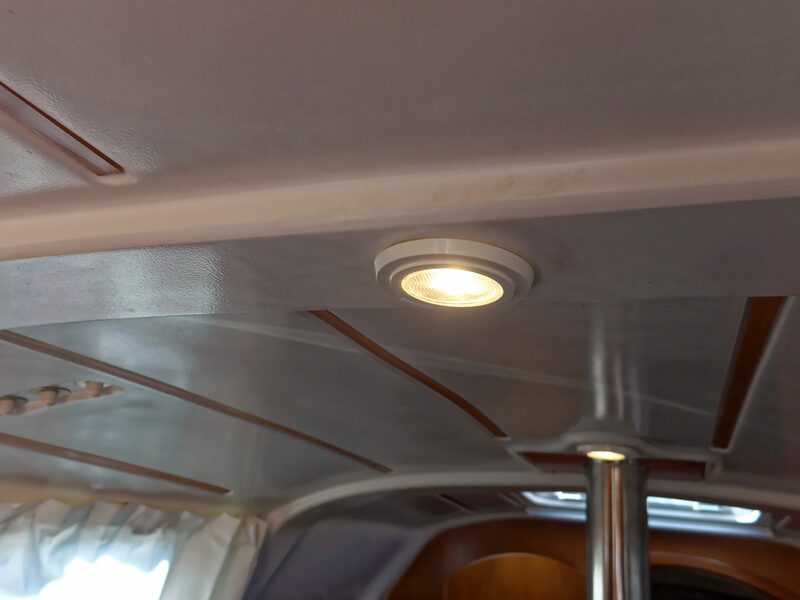 I did install two red/white switchable LED lights from MarineBeam — one in the head, and one in the galley, for $22 each. These lights start out red when first turned on, and if cycled quickly, flip back to white. While the white is still too harsh for my liking, the red feature is convenient for evenings and when night vision is important. These lights have been heavily used the last year at night to let folks find their way around the boat. I still wanted a warmer light in the cabin areas, and started looking around for alternatives. Most of the marine LED options had warm white options, but I was suspicious of the quality of light given the number of the LEDs on their lights, and the LED manufacturer. I had gone through almost 3 years of experimentation at home for LED strips and bulbs, trying all sorts of different manufacturers and types of LEDs to get similar warm light. 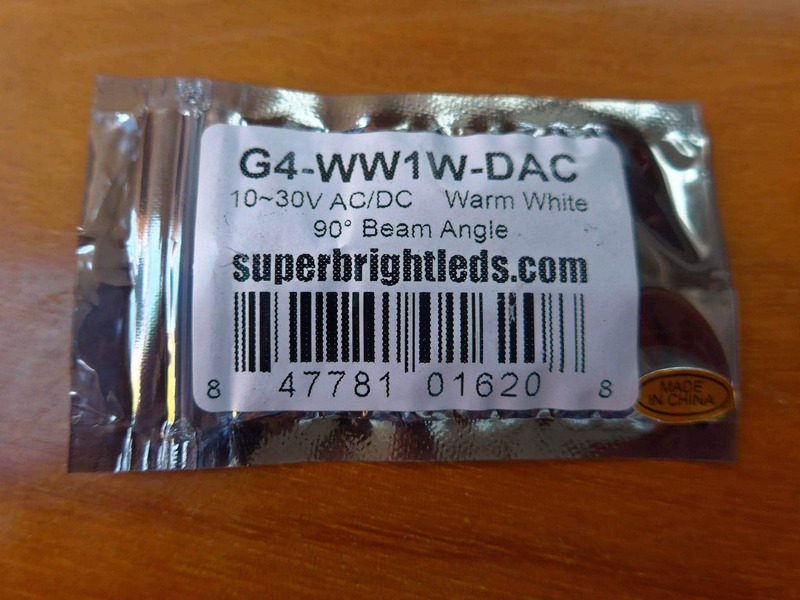 I ended up buying a number of different types of lights from SuperBrightLEDs.com and loved the quality of information they include on each light on their website. In particular, they list the color temperature, amperage draw, LED manufacturer, and a lot more useful information that can help make a decision easier. I found that they had a G4-style light listed on their site, and after reading through the specifications, decided to order a few. The unit I ordered was part number G4-WW1W-DAC at a cost of $5.95 each. They came in individual static bags. What attracted me most to them was that they had a single CREE LED, which I had used at home for other purposes, and found it to have a great quality of light. The light itself is very well made, and has a single CREE LED right in the middle, and two lengthy pins that can be cut down to fit. I had to cut off about 1/2 of the total length for them to fit in my fixtures. The specs say they use a constant power driver, which is critical on the boat where the voltage will vary depending on whether you’re on dock power, charging, running the motor, or completely on battery power. This is an area that some folks overlook, and end up getting cheap LEDs that fry themselves the moment the voltage goes outside a specific range. These units are good for 10-30V DC, which is a perfect for the boat. The quality and warmth of the light is what I was most interested in, and I was not disappointed. The specs say that the color temperature was 3100K, and it has proven to be very warm and comforting – even better than the original halogens. 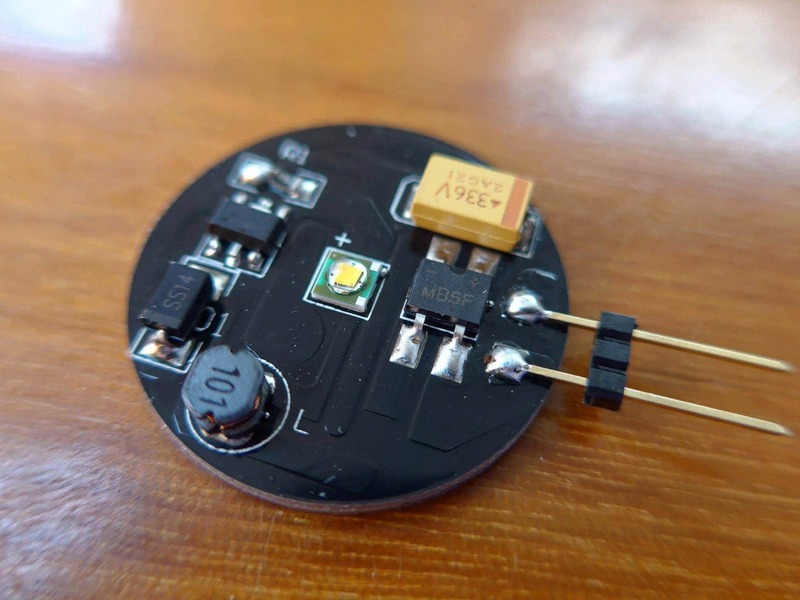 The single CREE LED has a 90 degree beam angle, which is more than enough to spread out the warm light and not focus in one place as many LEDs do. Overall power usage per bulb is about 1 watt, which is far less than the 20 watt halogen bulbs originally installed. And they do not get surface-of-the-sun hot! All told I replaced one in the v-berth, three in the main salon, and four in the owners cabin with the SuperBrightLEDs model for a total of $47.60. As mentioned above, I replaced the head and galley lights with red/white lights for night vision which cost $22 each, for a total of $44. I may replace one or more of those with this warmer model depending on crew feedback this season. 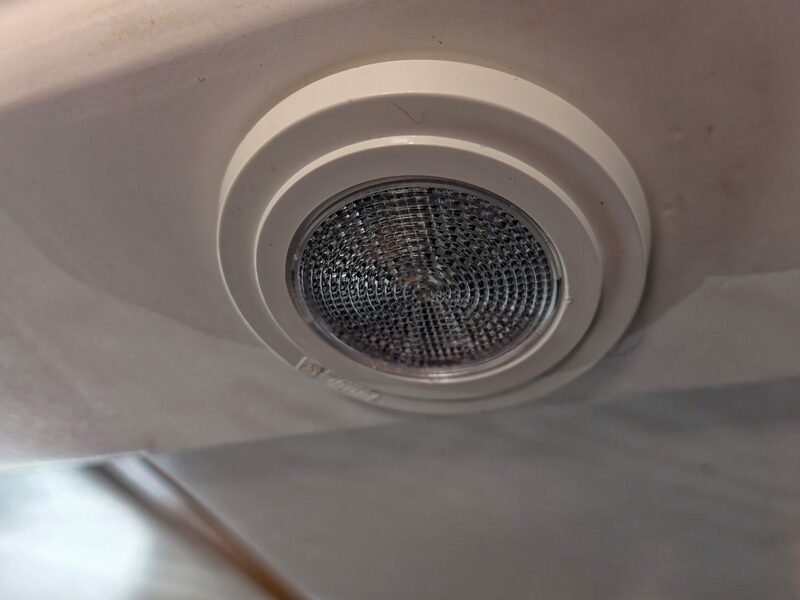 I believe LED light replacements are one of the best and first things any new owner should do for power savings and longevity. 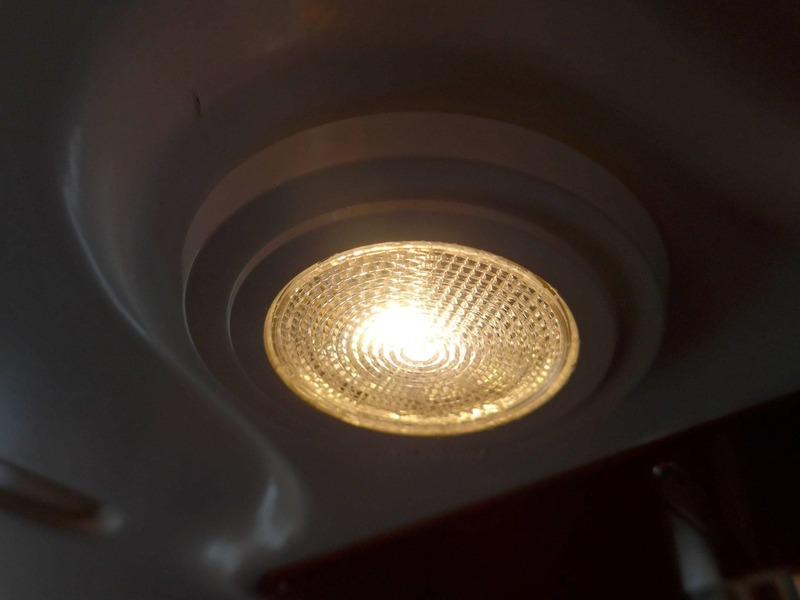 LED replacement bulbs are inexpensive and readily available at many places, and you do not need high-priced “marine” versions as long as they have decent quality LEDs, and constant drivers. The next project on Grace is LED RGBW strip lights in various places for ambient light everywhere, all controlled by a central controller and Amazon Echo.